Two prisoners made headlines this week after escaping from the Clinton Correctional Facility in upstate New York. People are coming to Google to learn how the two broke out of the prison and about the status of the manhunt, which is still ongoing. In addition to more than 100K searches each for [prison escape] and the facility itself, people are asking questions like “How often do prisoners escape?” and “How many prison escapes are there per year?” The incident has also sparked interest in other prison escape tales; search interest in “The Shawshank Redemption” spiked 8X in the past week. And in happier, more fictional prison news, Netflix dropped the third season of “Orange is the New Black” six hours early yesterday, leading to a jump of 500,000K searches for the hit show. Next, the NBA Finals are heating up as the Cleveland Cavaliers and Golden State Warriors are now tied at two games apiece, and searchers can’t get enough. There were more than 2 million searches for the Finals on Saturday, when the Cavs beat the Warriors in Game 2, and another 5 million when the Warriors went down 2-1 in Game 3 as people looked for scores, news, and players. There were more than 500K searches on Thursday for LeBron James, who got stitches after colliding with a cameraman during the game. Meanwhile, league MVP and Warriors point guard Steph Curry has been a hot topic on Search throughout the playoffs, but as his performance in the Finals faltered in the first few games, search interest in several of his teammates has risen. People have been looking for info about Curry’s fellow “Splash Brother” Klay Thompson and about Andre Iguodala, who started his first game of the season on Thursday and may havepoked some fun at LeBron James in the process. Off the court and onto the pitch, it’s also a great time to be a soccer fan, between the Champions League final, the Copa America, and the Women’s World Cup. 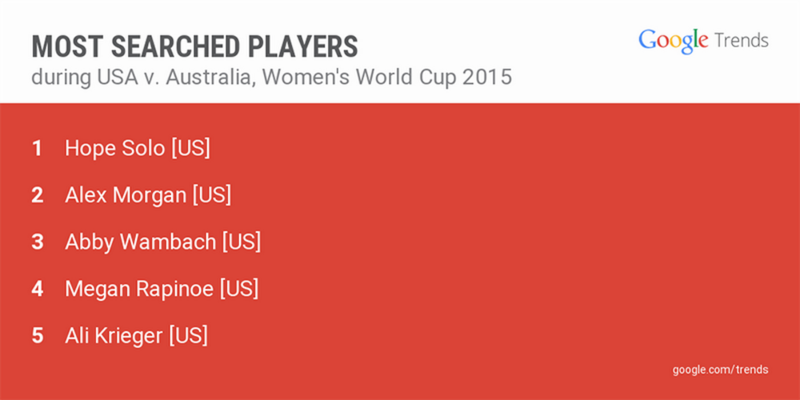 The latter drew more than 5 million searches on Saturday alone, and as the U.S. faced off against Australia Monday, interest was high in players like Alex Morgan, Hope Solo and Sydney Leroux. Finally, we’d be remiss to write about sports this week without mentioning the first Triple Crown winner since 1978, American Pharoah, who won the Belmont Stakes last weekend and ran home with a million searches in the bargain. Beyonce was trending this week after revealing that she has adopted a vegan diet on Good Morning America. Many of Queen Bey’s fans were disappointed that her announcement was about her eating habits, and not the release of a new album or baby #2. Giving up cheese would be hard enough. But this week pop culture fans confronted the potential loss of something else dear: the long-running (fictional) marriage between Homer and Marge Simpson. With the 27th season of “The Simpsons” on deck in the fall, the show’s executive producer had hinted that TV’s longest-running couple might separate. Amidst the outrage and worry, searchers turned to the web to ask “Why are the Simpsons getting divorced?” Luckily, it seems the rumors are just that—the show cleared the air on Twitter and in chalk. Keep up with Hope, Alex and the rest of the Women’s World Cup on your phone. To get updates on all the matches, just open the Google app and click Customize (Settings in iOS) → Sports → Add a team. Goooaaalll!